The Lau Integrated Study Site (ISS) has provided unique opportunities for study of ridge processes because of its back-arc setting in the southwestern Pacific. Its location allows study of a biogeographical province distinct from those of eastern Pacific and mid-Atlantic ridges, and crustal compositions along the ridge lie outside the range of mid-ocean ridge crustal compositions. The Lau ISS is located above a subduction zone, at an oblique angle. The underlying mantle receives water and other elements derived from the downgoing lithospheric slab, with an increase in slab influence from north to south. Water lowers the mantle melting temperature and leads to greater melt production where the water flux is greater, and to distinctive regional-scale gradients along the ridge. There are deeper faulted axial valleys with basaltic volcanism in the north and inflated axial highs with andesites in the south. Differences in igneous rock composition and release of magmatic volatiles affect compositions of vent fluids and deposits. Differences in vent fluid compositions and small-scale diffuse-flow regimes correlate with regional-scale patterns in microbial and megafaunal distributions. 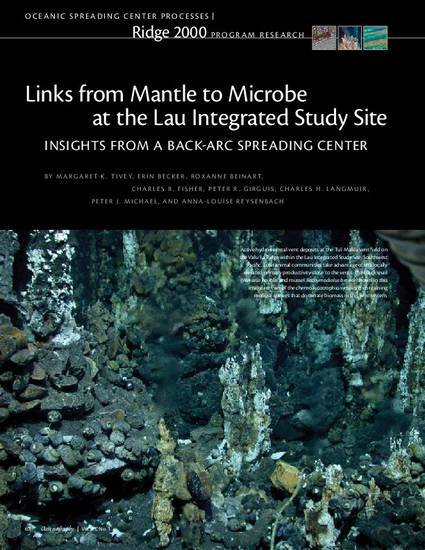 The interdisciplinary research effort at the Lau ISS has successfully identified linkages between subsurface processes and deep-sea biological communities, from mantle to microbe to megafauna. This article is posted here by permission of The Oceanography Society for personal use, not for redistribution. The definitive version was published in Oceanography 25, no. 1 (2012): 62–77, doi:10.5670/oceanog.2012.04.